Breckenridge, CO – Mountain Dew and TEN: The Enthusiast Network have announced the initial schedule for the annual winter Dew Tour ski and snowboard competition and festival to be held in Breckenridge December 14-17. 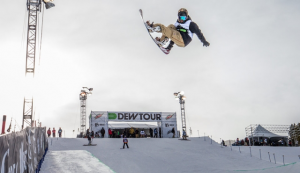 This year’s winter Dew Tour will serve as a U.S. Ski & Snowboard Olympic qualifying event for men’s and women’s halfpipe and slopestyle snowboarding and skiing competitions. The Dew Tour will also host its signature Team Challenge and Streetstyle competitions and a calendar of fan-based activities, both on the mountain and within the town of Breckenridge. The Tour kicks off with the qualifying rounds of Men’s and Women’s Ski and Snowboard Slopestyle and Halfpipe competitions on Wednesday, December 13 and Thursday, December 14. The top seeds will continue to the finals on Friday and Saturday, all of which are U.S. Ski & Snowboard Olympic qualifying events. Thursday night is the annual POWDER Awards to be held at the Riverwalk Theatre in Breck. Friday, December 15 includes Men’s and Women’s Ski and Snowboard Superpipe finals beginning at 10 a.m MST. That evening, Dew Tour’s signature Streetstyle event will feature a ski and snowboard jib session held in downtown Breckenridge, followed by the TRANSWORLD SNOWBOARDING annual Riders Poll Awards at the Riverwalk Theatre. On Saturday, December 16, Olympic qualifying events continue with the Men’s and Women’s Ski and Snowboard Slopestyle competitions starting at 9:30 am. Dew Tour’s tradition on of incorporating music, art and culture into its events will be highlighted Saturday evening with its concert at the Riverwalk Theatre. Details on the concert and ticket sales are forthcoming. Then on Sunday, December 17, Dew Tour’s Superpipe and Slopestyle courses will be specially modified for the unique Team Challenge, which includes 12 of the biggest winter hardgoods brands (six ski and six snowboard) competing in a format that embraces the industry’s community. Each brand has one team captain and three of their team athletes compete in one of three sections — modified Superpipe, jibs and jumps. From Thursday through Sunday, the Dew Tour Experience will be showcased at the Peak 8 base area with a myriad of activities, athlete autograph signings and free giveaways featuring Dew Tour partners. In downtown Breckenridge, the Dew Tour Après Festival continues from 2 p.m.-6 p.m. Friday – Sunday at Blue River Plaza and Riverwalk Lawn, with après festivities, partner exhibits and live music.